Give your child the best seat outside the house with the ultimate solution in stroller support and style. Cush 'n Go offers soft and stylish support for baby's back, head, & neck. High-quality memory foam conforms to infant's head, decreasing resistance and the risk of flat-head syndrome and recommended by medical professionals.. Each Cush 'n Go Memory Foam Stroller Liner offers two-sided reversible designs. The solid color is 100% polyester minky fabric, the patterned side is 100% cotton fabric. 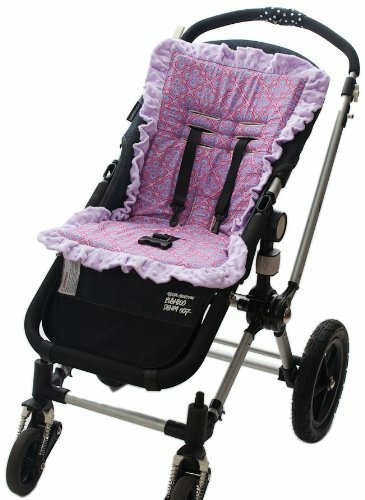 Compatible with most stroller harness systems and protects your stroller seat from spills and stains. Machine washable (read care instructions). Memory foam cushion dimensions 27" L x 12" W x 1" D.
If you have any questions about this product by Baby-BeeHaven, contact us by completing and submitting the form below. If you are looking for a specif part number, please include it with your message.